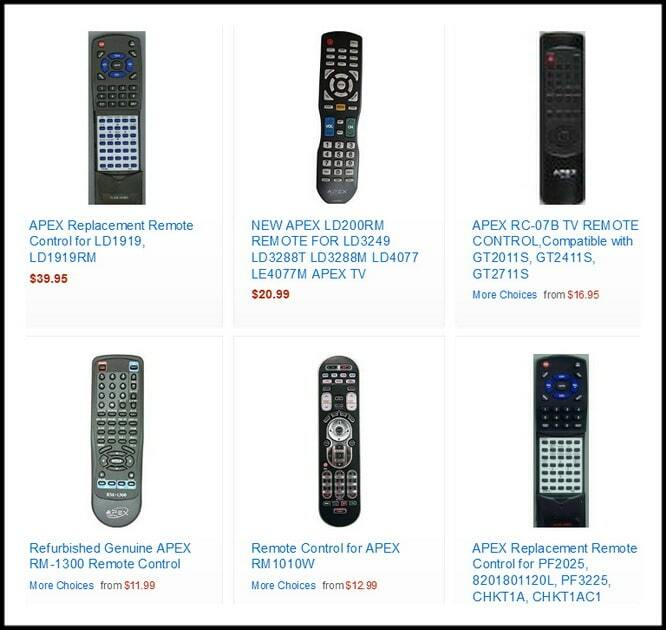 Need remote control codes for your APEX TV? We have a list of all known and working remote codes that will work with APEX TVs, APEX VCRs, APEX DVD players, and APEX audio components. The remote codes for APEX are 4 and 5 digit remote codes. The remote codes will work with all universal remote controls when programmed using the remote user’s manual. The APEX TV codes will also work for SAT and CABLE remotes. If you have any issues with the APEX TV remote codes not working, leave your question below with the model number of remote and APEX TV. Need more codes for your APEX TV, DVD, or VCR? Please leave your question below and we will be happy to assist you further. Do these codes work for the old 20 inch CRT TV’s? Need code for APEX AD1200 DVD player using ONN remote. We have Spectrum TV remotes. Is there a code for programming to my Apex TV? I need the codes for the older model box Apex 27 inch TV. I have a Phillips SRSP107 REMOTE and a Apex digital TV/DVD COMBO model LE3243. WHAT CODE DO I NEED TO USE MY REMOTE? I have an Apex TV model # LD4088. I am trying to pair with a Dish network remote controller model# 52.0. I have tried all codes to no avail. Simply choose the 52.0 remote on the DISH page and follow the instructions…. How To Program DISH 52.0 Remote To TV. I have time Warner cable. The remote is a clikr-5 model # ur5u-8780L. The sound bar that I have is an apex asb6000. The code above 4049 does not work. I was wondering if there is any other codes that might work. I am having a very very hard time programming my GE-7252-27985 universal remote to my Apex digital TV LD3288T I have tried every code and method to try and program it.